We have a friend who was ordained in the permanent diaconate. Does that mean he can't ever change his mind, and go on to become a priest? My husband was thinking that due to such a clerical shortage, this deacon ought (and would be the type) to pursue that, but it's called permanent diaconate for a reason--yet it seems likely there is some dispensation or form to release him from the diaconate into pursuing that? Fortunately, to address the question we are now able to consult the United States Conference of Catholic Bishops document National Directory for the Formation, Ministry, and Life of Permanent Deacons in the United States, which was approved in 2003 and released for publication in 2005. For those of us in the diaconate, the National Directory was a long-awaited document that answered many questions, for which the responses tended to vary regionally. It does, in fact, seem reasonable that there should be some permission or other means available by which a widowed or celibate deacon might enter the priesthood. After all, people do change directions in life, and it's true that many deacons possess the qualities that go into making good pastors. I have, in fact, known of several deacons who became priests after being widowed. Though this certainly has never been the norm, even before the release of the Directory. There are also occasions that I am aware of in which the transition from deacon to priest didn't work out. In one case, with which I am familiar, a deacon became a priest and then subsequently left the priesthood to remarry. Naturally, such mishaps might give rise to practical arguments against ordaining men to the priesthood who have been accustomed to married life. However, in my opinion, this in itself is not a strong argument against allowing deacons to become priests. The stronger argument simply has to do with the permanence of the order. Since the history of the order over the last millennium, however, has been centered on the diaconate as a transitory stage leading to the priesthood, actions that may obfuscate the stability and permanence of the order should be minimized. 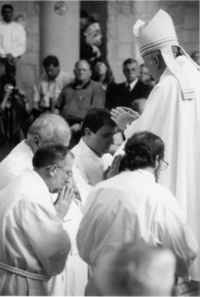 This would include the ordination of celibate or widowed deacons to the priesthood. "Hence ordination [of a permanent deacon] to the priesthood...must always be a very rare exception, and only for special and grave reasons..."
However, the document goes on to leave open the possibility of ordaining a permanent deacon to the priesthood given that the diocese adheres to the correct protocol and insures the suitability and proper education of the candidate. Still, it is clear that the role of the permanent deacon is, typically and most suitably, to remain a deacon throughout life. Nevertheless, in the case of the deacon in the question, I would advise him to consult with his bishop and be in prayer and discernment. Some the Lord called as teachers, and some to be prophets. Others he called to be evangelizers, and still others to be apostles. By the same reasoning some are called to be priests, and others the Lord calls as deacons. Whatever the calling, our role--our responsibility--is to accept God's will in our lives and to rejoice in that which we do. Our responsibility also is to discern the call of God and to be ready to go forth when he calls. Rise up, your light has come! It's a funny coincidence, but at the very moment when I typed those words the doorbell rang. Rather than it being three wise men, it was UPS delivering the photographic flash that I had ordered well before Christmas. Rise up, your light has come! In all seriousness, what we receive in today's first reading is the resounding summons that the glory of God shines upon all the peoples of the world. Epiphany is the story of the arrival of the light, and it's the story of the bringing of gifts. In both senses it connects to us, and we connect to it, in a most meaningful way. The God in whom we believe reveals himself to us in the iridescent face and heart of Jesus, born to be the savior of all. Thus our January 6th celebration of the Solemnity of the Epiphany, the traditional 12th day of Christmas, begins with a tone of great joy. The long awaited light, the true light that enlightens everyone, has appeared in stark contrast to the darkness that was before. The light that illumines the darkness is the light of truth, and of the light that is the certainty of our faith; it is that which illuminates our hearts and gives us the hope of salvation. It is the radiance that reveals the Lord Jesus to us as the one source of salvation for all people. To us appears the redeemer of Israel who has come to tear down the walls of separation between Jew and Gentile, as the arrival of the pagan Magi attests. He has come to bring hope, and most importantly, to bring it to those without hope. He has come to establish justice among the peoples and nations of the earth, but in a more profound sense he has come to establish for those whose lives cry out for justice. Through his incarnation and birth, Jesus reveals his presence to the whole world; he shows us the way to Eternal Life. He shows us the life that is the light of all people. The Magi followed the star to Bethlehem where it rested over the place where the infant was. Though they followed the star, it was Jesus who truly guided them. It was he who illuminated the night as they brought their gifts and worshipped him in the arms of Mary his mother. We too bring our gifts and we worship him. However, what we have to give is what he has given us already. Just as St. Paul says that his is a stewardship of grace, we too have that for which we are responsible. We are indeed coheirs to the promise of salvation; therefore it is incumbent upon us to proclaim the Good News and to share the good things of God's kingdom with all. It is the love of Christ that compels us, for the greatest gift, the truest gift, is the gift of God who is love. In the Epiphany light that shines in the darkest corners of life, much becomes clear and apparent. In Christ we allow the light to consume the darkness of sin, both in our lives individually and throughout the world. Perhaps the greatest gift we have is the stewardship of proclaiming and sharing the Good News of salvation, which our Lord, Jesus Christ alone, can offer. As children of the light each of us has the duty allow the light to shine forth from our lives. We proclaim salvation not only by what we say but by how we live—how we share the gifts we have received. Epiphany foreshadows the journey of Jesus' life. While it marks the beginning it also anticipates the Sacred Triduum—when the greatest of gifts was given. Epiphany reveals salvation as a lifelong endeavor. We follow the light, and we celebrate the gifts we carry along the journey. Ours is the comfort of the presence of the Body of Christ; ours is the gift of the visible sign of the Church; ours is the sacramental assurance of the forgiveness of sins, and ours is the justice; it is the good that we give in return. Epiphany reveals a lighted path; it manifests the way—the only way that leads to life.